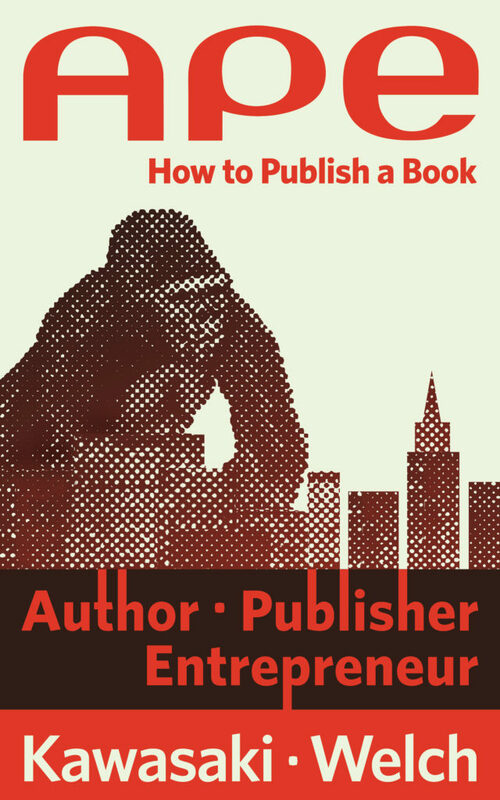 When I heard that Guy Kawasaki and Shawn Welch had just published “APE: Author, Publisher, Entrepreneur – How to Publish a Book,” I requested a review copy. The book explains how to turn an idea into an outline, how to turn that outline into a book and how to self publish your own book. I absolutely loved the detailed information that they provided in this book. I’ve thought about writing a book before but it wasn’t really a goal of mine. It’s not something I always hoped that I would do one day. That is until after reading APE. I don’t even know what to write about but I feel like putting something together just so that I can follow the steps laid out in APE. You know how when you see a fun DIY project online, like something on Instructables.com, and you think about how much fun it would be? APE makes me feel that way. It makes the whole book writing process so clear. I actually did a review of Guy Kawasaki’s “Enchantment” a while ago, which I loved, so I couldn’t wait to start reading this one. Just like his last one, I couldn’t put APE down. Every time I’d get to the end of a chapter I couldn’t believe that it was over. Guy has a way of writing that’s not only extremely helpful, but actually a lot of fun to read. He has definitely made a fan out of me. Check out this full list of the chapters. Anything you can think of is covered in one of these chapters. I am amazed at all of the great information they included here. As I mentioned before, writing a book was never something I had wanted to do, so obviously I’ve never done any type of research into what goes into the process. I’ve heard a lot of people talk about how miserable the book writing/publishing process is though, so maybe that’s why I never cared to try it. Either way, I went into this book with no knowledge of the subject whatsoever and came out with all sorts of great info. One of my favorite tips is to use the Espresso Book Machine from On Demand Books. Instead of using a blocked-off room of your house to stock pile a bunch of books that nobody wants, you can just let people order a book and Espresso Book Machine will print it out at the point of sale and ship it out. How awesome is that! I also really liked the authors tips on promoting the book. They’re super-creative and they sound like they would be a lot of fun to do too. One example is the idea of getting shirts, buttons, stickers and other things printed and then handing them out as gifts. They list many other marketing tips too, and the nice thing is that none are ridiculously expensive. Some of his most expensive marketing tactics were to create infographics or to run contests. I suppose infographics from a talented designer can get quite pricey ($400.00+), but in the scheme of things, it’s usually worth the cost. They also discussed some great tips on using photos for social media profiles. Guy actually talked about several of these tips in his book “Enchantment”. In APE, they also talked about things like the best times of the day to share (Twitter, Facebook, Google+), how to use hash tags, why you should repeat tweets, and they also discussed some useful tools to schedule posts. As you can probably tell, I really enjoyed reading APE. Guy Kawasaki writes books that are full of information and zero fluff. I know I sound like a fanboy and that’s because I am. This book really is that awesome. Alex – Thanks for the book review. I’m going to check it out. One note: Have you seen Amazon’s print-to-order program? It seems pretty similar, and for a small run of books it’s very affordable. Hey Jason, this book also discusses Amazon’s CreateSpace program too. I’m seriously considering writing a book just so that I can utilize the information from this book. Maybe I’ll write a sci-fi novel for NaNoWriMo in November, lol. I really have no idea what I’d want to write.